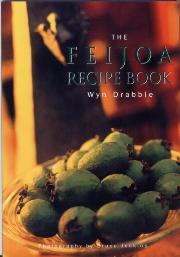 The second printing (2010) of The Feijoa Recipe Book by Stonepress Publishers is now available. For only NZ$21.95, you can have your own copy of the world’s first full colour professional cookbook dedicated to feijoas. Written by New Zealand foodie Wyn Drabble, with photography by Bruce Jenkins. You can buy it direct from the Stonepress website http://www.feijoa.co.nz/ or if you’re in New Zealand, copies are available through Paperplus, Takenote or specialty bookstores.